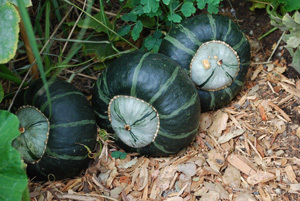 Three hundred years ago, growing squash (Cucurbita spp.) was a matter of survival. Winter squash and pumpkins could be stored for months, and were an important source of calories and vitamins in the dead of winter. Squash were grown in the Mesopotamian Fertile Crescent 8,000 years ago, and they’re part of the Three Sisters Polyculture—corn, beans, and squash—that sustained the rise of the Mayan and Aztec civilizations in Mesoamerica. Squash have served us well. Today we can pick and choose among dozens of squash varieties, in all colors, shapes and sizes. Summer Squash—like zucchini, crookneck, and patti pan—are harvested small, while the skins are still soft. Winter Squash—like butternut, acorn, buttercup, and turban—are left on the vine to ripen, and harvested in the fall. They’re called winter squash because we eat them through the winter, not because you can grow them through the winter. Growing squash is easy, whether you’re growing summer squash, growing zucchini, or growing winter squash. The sizes, shapes, colors and fruit of the vines may vary, but the cultural requirements are the same for each of these cucurbits. Squash and other cucurbits are strictly summer vegetables that die at the first touch of frost. If you're growing squash in short-summer gardens, you can start seeds indoors 3 weeks before your last frost date, and set plants out once the soil has warmed up. 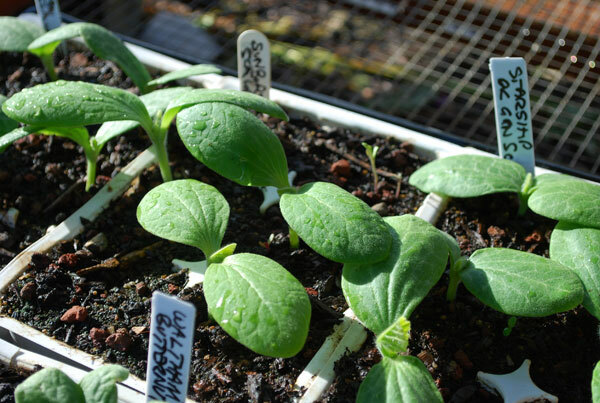 To start indoors, plant squash seeds ¾” (1.5cm) deep in flats or large-celled 6-packs. Soak the potting soil and place them in a warm place until germination, which should occur in 5-10 days, depending on temperature. 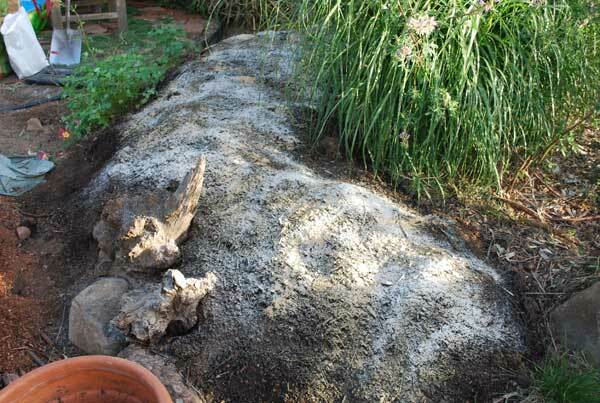 Don’t let the soil dry out, but avoid excessive watering—especially in cool weather. Squash seeds rot in cool, wet soil. If you're growing squash in long-summer gardens, sow seeds directly in hills or rows a week or two after your last frost date. See Planting Squash below for spacing. When temperatures are cool, sow extra seeds. Squash seeds germinate poorly in cool soil. Squash are heavy feeders, and perform best in soil with ample organic matter. When growing squash, prepare the soil to a depth of 18-20” (46-51cm), or single-dig, and mound soil up into hills to create a deep root zone. Lay down a 2” (5 cm) layer of good garden compost or composted manure when you prepare the lower soil layer. Mix it in, then lay down another 2” (5 cm) layer and mix it in when you prepare the top of the hill. You can also add organic fertilizers and soil amendments at the same time. In the photo above, I've dusted on alfalfa meal, feather meal, greensand, kelp meal, and oyster shell flour. The amendments are tilled into the soil before planting. If necessary, adjust the soil pH. Optimal pH for growing squash is 6.0-6.5, or a slightly acidic soil. See Changing Soil pH for ways to adjust soil pH. If your soil is lean or you’re short on compost, you can add organic soil amendments, as I have, but it's usually simpler to add a good balanced organic fertilizer like Dr. Earth Organic Tomato, Vegetable, and Herb Fertilizer. Look for one that contains myccorhizae (beneficial fungi) that help fruiting plants like squash assimilate more nutrients from the surrounding soil. Squash are traditionally planted in “hills” of 2-3 plants, with several feet between hills. Growing squash usually have siblings. 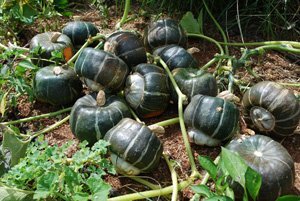 Some winter squash actually perform better with 1 or 2 other plants a foot or so away than they do when planted separately. Direct Seed Sowing. 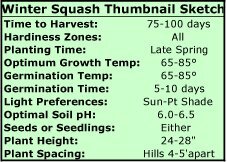 If you’re planting squash seeds directly in the ground, sow seeds 1” (2.5cm) deep and 6-8” (15-20cm) apart, in hills spaced 3-5 feet (1-1.6m) apart. Plant 6-8 seeds/hill, and thin to the strongest 2-3 seedlings on each side of the hill when the plants are 3-4” (7.6-10cm) high. Failure to thin will dramatically decrease yields. Planting Squash Plants. If you’re planting squash plants, don’t waste your time—or money—planting leggy plants that are already flowering in the pots. 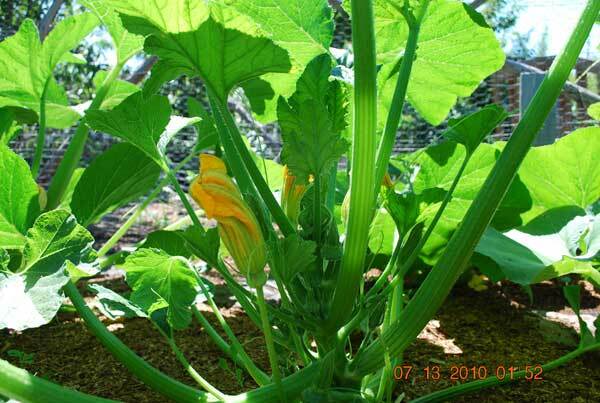 Squash seedlings that are already forming multiple flowers in tiny pots will develop into stunted plants and produce small yields. You’re better off just planting seeds directly, even in short-summer areas. The best stage for planting squash seedlings is after they’ve developed the first set of true leaves, but before they develop the second. When planting squash plants, try to avoid disturbing the roots as you transplant the seedlings. 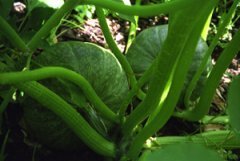 Cucurbits take longer to get established when transplanting disturbs their roots too much. Squash, like other cucurbits, have a broad, relatively shallow, but extensive root system. Because much of the root system is within the first 12" (30cm) of soil, mulching is critical, expecially in hot climates. Apply a 2-4" (5-10cm) layer of mulch after planting. Squash plants need a lot of space around them, whether you plant them in deep-dug or raised garden beds, or in conventional hills. Winter squash need more space than summer squash, and vining types need more space than bush types. 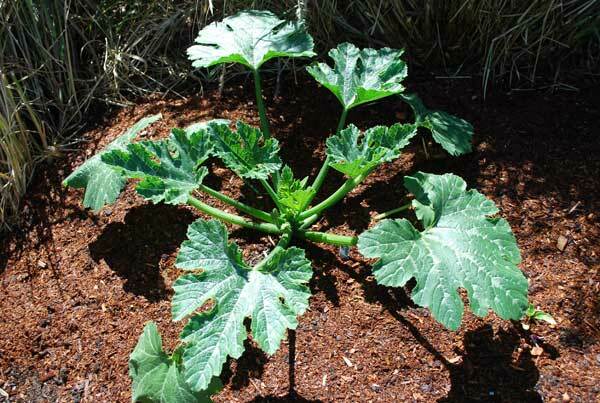 Plant summer squash 12” (30cm) apart, in hills 3-4 feet (1-1.3m) apart. Give bush varieties 3 feet (1m) between hills, and vining varieties 4 feet (1.3m). 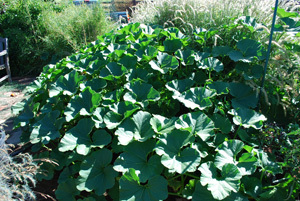 Plant winter squash 14-16” (36-41cm) apart, 2 plants/hill, with hills 4-5 feet (1.3-1.6m) apart. Give bush varieties 4 feet (1.3m) between hills, and vining varieties 5 feet (1.6m). When growing squash, overcrowded conditions promote powdery mildew and other squash diseases, so make sure the plants are spaced properly and have plenty of air circulation around them. Growing squash requires regular, steady water, 1-1 ½” (2.5-3.8cm) per week. This is especially important during hot, dry weather. 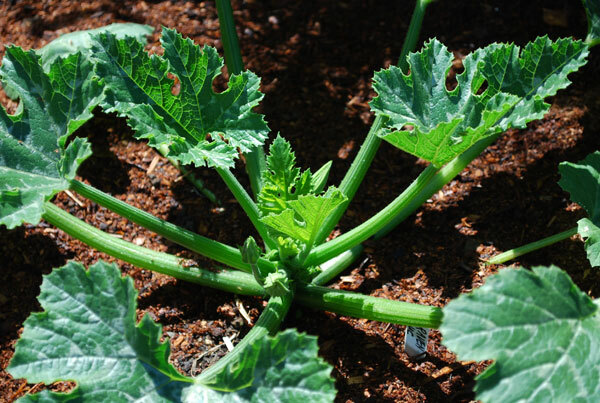 During the first couple weeks after planting, overhead watering is okay for summer vegetables like squash, but water on the foliage of mature squash plants increases fungal diseases like powdery mildew. This is especially true once plants start setting fruit, and defending leaves from pathogens takes a back seat to fruit and seed production. 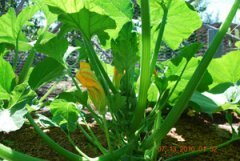 Drip irrigation is best for growing squash, but if you do use overhead sprinkling, do so early in the day so the foliage has time to dry before evening. Squash are heavy feeders, so even if you build organic soil amendments into the soil when planting squash, they may need a side-dressing of compost, composted manure, or a good organic fertilizer like Dr. Earth Organic Tomato, Vegetable, and Herb Fertilizer at mid-season. Once they’re up and growing, squash don’t take a lot of work. frequent harvesting is the biggest chore for summer squash and zucchini. Watch for signs of disease or pest problems early in the season, and intervene quickly to prevent more severe problems. Cut out old leaves that are overshadowed by larger, newer leaves. They’ll pick up powdery mildew and transmit it to the newer leaves later in the season. When growing squash, older leaves will often take on a tattered, beaten appearance, or grow fuzzy with powdery mildew. This usually won’t affect yields, but you can always cut old leaves off where they join the main stem. As the vines are growing and spreading, you may want to bury a few nodes (points where side-vines branch from the main vines) under a few inches of soil or mulch. This will encourage rooting from the nodes, so the whole plant doesn't die if a main vine is severed, cut off by squash borers, or the roots get munched by gophers. This is especially important if you're growing squash where squash borers are a problem. 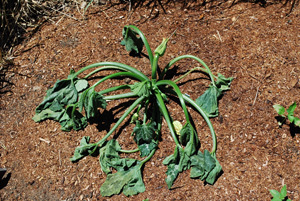 Gophers can kill a squash plant quickly by eating the roots. Sudden, severe wilting of the whole plant–as opposed to a single vine–is a sign of gopher damage in the west, where pocket gophers are the bain of gardeners. Lining the beds with wire mesh to keep gophers out and trapping are the best solutions. 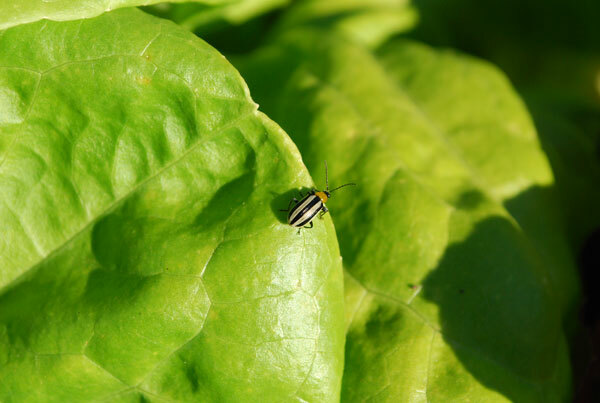 Squash pests include Spotted or Striped Cucumber Beetles, Squash Bugs, and Squash Borers. 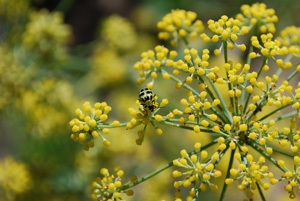 Adult beetles and nymphs chew holes in leaves, and heavy infestations can reduce yields significantly. Dr. Earth Organic Vegetable Garden Insect Killer is a ready-to-use spray that’s a combination of essential oils of rosemary, sesame oil, peppermint, thyme, cinnamon, and garlic. Controls whiteflies, aphids, mites, scale, mealy bugs, sowbugs, pilbugs, earwigs, caterpillars, leafhoppers, beetles, spiders, ants, crickets and other insects. 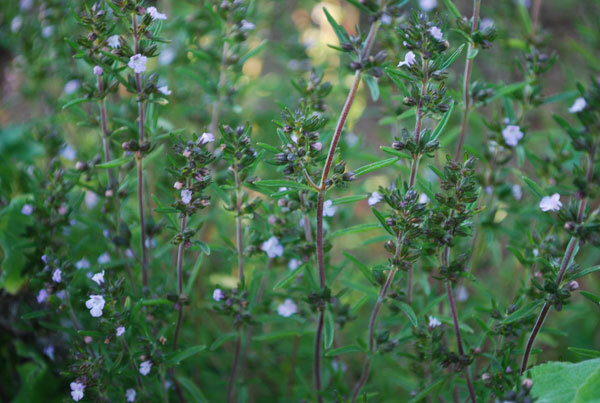 It can be used on edible vegetables up to the day of harvest. It is not persistent, like chemical insecticides, so repeat applications may be necessary to control heavy infestations. 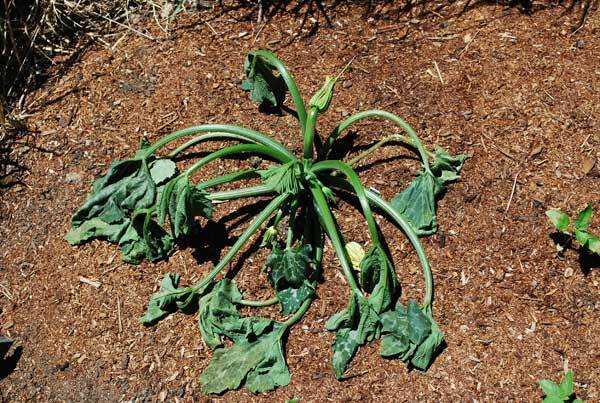 These pests don’t just do physical damage to your squash plants, they also transmit diseases, so when growing squash, take measures to keep them from getting out of hand. Timely action early in the season can reduce pest populations and problems for the rest of the summer. Squash Borers are orange moths that lay their eggs near the base of squash plants. Unlike most moths, they fly in the day and are strong flyers. They're sometimes mistaken for wasps because of their shape, daytime activity, and strong, straight-line flight. The larvae hatch, and burrow into the stems of squash. If you see leaves wilting and dying off suddenly, follow the vine back to the nearest healthy leaf, and look for a fan of stem frass—chewed-up stem shavings—to locate their tunnels. Dig the borer(s) out of the vine with a pocket knife. Try to avoid severing the vine or any digits. If you bury the vine scar under a little soil or mulch and water it, the plant will develop roots from the wound. Butternut squash varieties have harder stems and are resistant to squash borers. Squash vine borers overwinter under vine debris left on the ground, so clearing and composting vines may reduce infestations the next year. Crop rotation is important, but squash vine borers are strong fliers so rotation in small gardens has little impact on these pests. As the vines start to run, bury a few nodes (branches off the main vine) under an inch or two of soil or mulch. This will encourage multiple root systems so the whole plant doesn't die if borers infest one vine. Use floating row covers to isolate the vines from the moths. Moths emerge in mid-June, when rising heat causes the vines to grow quickly. Covering the vines with row covers prevents borers from finding vines to lay eggs on. Be sure to clear and compost vine debris at the end of the season. Borers overwinter under vine debris. If you have chickens, try a light tilling 2-3" (5-8cm) down, and turn the chickens loose on the plot. They'll find any larvae or pupae exposed by the tilling. For heavy infestations of squash bugs or borers, use floating row covers to prevent adults from laying eggs on your plants. See Companion Plants for planting strategies to reduce squash pest problems. 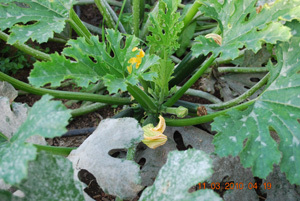 Cucumber Mosaic Virus affects most cucurbits, including squash. Resistance varies with variety. When growing squash, Powdery Mildew is a common scourge. 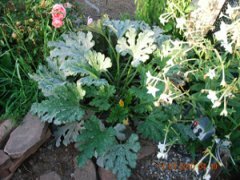 Plant resistant varieties in cool-summer, shady, or wet gardens where powdery mildew is widespread, and give plants plenty of space between to improve air circulation. For early-season infestations, cut out infected leaves and hot-compost or throw in the trash. You can also spray the tops of the leaves and stems with a mixture of 1 part milk to 9 parts water to inhibit fungi. Alternately, a mixture of 1 tsp baking soda/quart of water sprayed on the leaves will raise pH and inhibit fungal growth. The dilute milk spray doesn’t eliminate powdery mildew, but it does suppress the fungus and limit it’s spread for a week or two. Powdery mildew late in the season is a natural part of senescing plants. The plant is drawing nutrients from older leaves to fuel fruit and seed production, so these leaves are more susceptible to powdery mildew. It doesn’t affect the fruit at that point, so I usually ignore it. 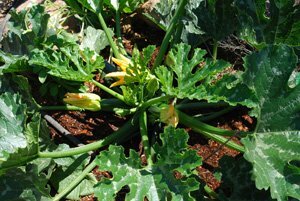 Be sure to clear plant debris from the field after harvest and hot-compost, and to rotate squash, cucumbers, and melons to another part of the garden the following year. For more information, see Cornell’s Vegetable MD Online for a series of articles on squash diseases, complete with photos. 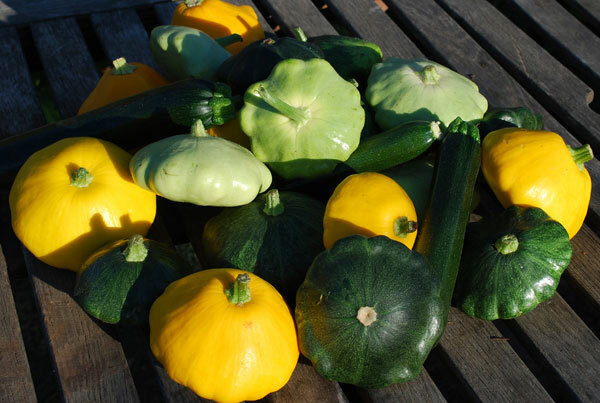 Cornell also has lists of disease-resistant Winter Squash Varieties , Summer Squash Varieties , and Zucchini . See Preventing Vegetable Diseases for some general rules on avoiding disease problems in organic gardens. Summer savory, basil, catnip, and other aromatic herbs are good companion plants when growing squash. Plant them in borders around the edges of the patch, or interplant them between hills. Their flowers attract and sustain pollinators, and their volatile oils help deter squash bugs and spotted (or striped) cucumber beetles. Abundant, tiny flowers provide nectar for gnat-sized parasitic wasps that attack pest eggs and nymphs. See Attracting Beneficial Insects for more information.